A little over a year ago, Christi was beginning her senior year at OSU studying kinesiology, but she knew something was missing in her life. She had always loved dogs, and thus began looking for jobs that might allow her to work with them again. It was around that time that she came across an opening at a place called Inavale Farm. Upon first walking through the doors, she noticed the place was controlled chaos, and housed many more dogs than she had ever encountered before. Among all of the stress on the first day of a new job, she was instructed to go harness up “the old white poodle” for his walk. She walked down the aisles until she saw his kennel card and read his name aloud “Gus”, before entering to meet him. It was as if the entire kennel fell silent the moment she began petting his head. He looked up into her eyes, and reassured her to relax and that she was in exactly the place she needed to be. From that moment on, their friendship blossomed. Gus’s owner was a busy older man, who traveled often for work which meant that Gus was often one of the smiling faces at Inavale for boarding. In turn, this meant that Christi and Gus got to spend almost every weekend together out at the farm. Anywhere from 30-60 dogs (sometimes more) would pass through this facility in any given week, but it was always Gus that stood out to Christi. 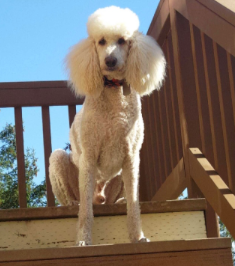 She had always been a sucker for puppies, but it was this curly white poodle that began to open her eyes to the magic that is a relationship with a mature dog. As the weeks turned into months, they grew closer. Any spare time during her work-day, Christi would spend cuddled up on the floor of his kennel with him, getting that same reassurance he gave her on that very first day. As Christi’s time in Oregon was coming to a close, she knew it was time to move on to bigger things, but that also meant she would have to part ways with what can only be described as her rock; Gus and the rest of her doggie friends. Her very last day at Inavale was bittersweet, she knew she had to go, but instead spent hours laying on the ground with Gus unable to say goodbye. When she was finally able to pull herself away, she began her journey back to Utah, eyes full of tears. Back in Utah, the only way Christi was able to communicate with Gus was through pictures her old co-workers would pass on. As weeks faded into months the updates on Gus began to take a turn for the worst. He was 13 at this point, and was aging rapidly and suffering from many ailments, to the point her co-workers urged Christi to try and make it out there in order to see him one last time. Devastated, Christi hopped in her car, and again with tears in her eyes, she began the 800 mile drive back to Oregon to try and see her old friend one last time. Upon Christi’s arrival into town, Gus’s situation had gotten worse and he had been hooked up to a feeding tube and was staying at the local vet’s ICU. She considered trying to visit him at the vet’s office, but due to her previous experience of working in a veterinary clinic she knew that this would only make things harder on Gus. Thus Christi remained in constant contact with Gus’s owner in the hopes that Gus may return home so she could come over and get one last dose of love from him before it was time to say goodbye. She stuck around town over a week, passing the time seeing old friends and their dogs, but all she was truly hoping for was one last hug from her curly friend. The time eventually came in which Christi had to return home, and with Gus yet to leave the ICU this meant that their reunion wasn’t going to happen. Christi was distraught and heartbroken, but knew that for the sake of Gus, this was for the best. Somehow she knew deep down that Gus was aware she had been there to see him, and that he knew she loved him with all her heart.